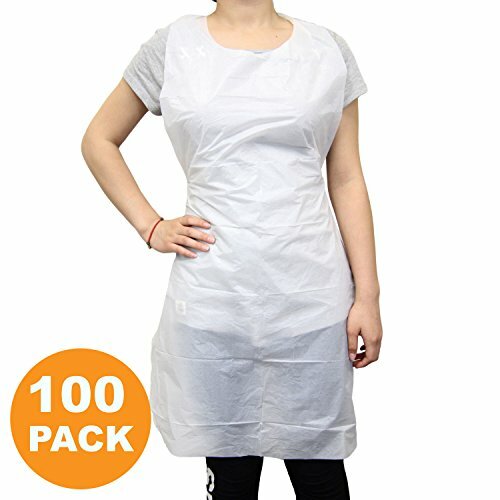 Disposable 24''x42'' Medium Waterproof Grease Resistant Poly Adult Women Men Bib Apron with Dispenser Box, White [100 Pack] by Fit Meal Prep at Turuya 7. Hurry! Limited time offer. Offer valid only while supplies last. 100 Pack in a easy dispesing box, sanitarily and individually dispenses from a box. Durable, water and grease proof, keeps your clothing clean and dry. Extra long ties to accommodate individual comfort preferences. Suitable for women and men. Disposable for quick cleanup and minimized washing expenses, great for household cooking or cleaning, cafeterias, delis, catering businesses, and more.